One of the most challenging aspects of vacationing is getting your luggage ready – even more so if you’re planning a sports vacation. This package lets you go on holiday leaving your sports luggage behind: Holimites will provide a Colnago CLX 3.0 with Ultegra 11v rental bike for free. Plus, you can join guided bike tours and walking tours. The Gourmet Hotel Gran Ander is the ideal place for those who enjoy fine cuisine and pampering service. A vacation haven to delight the palate and replenish the soul! At Ustaria Posta we write tradition with a capital “T”. Elegant simplicity defines this family-run hotel that will make you feel like you’re spending a vacation among friends. Hotel Gardenazza was renovated in 2015. Natural wood furnishings provide a modern, yet warm and cozy ambiance. The road bike rental included in this offer starts the day after your arrival (at 8:30 AM) and ends the day previous to your departure (within 6:30 PM). The bike rental on arrival and/or departure day is on request and depends on availability. Starting at 69.00 Euro per person/per night, including Colnago road bicycle rental. Extra services can be added to this package; the price of individual services varies according to request. *Prices are approximate and per person and day in a standard room during low season, and includes the cycling package and road bike rental. To receive a detailed offer, please click on “book”, then choose any additional services you’re interested in; prices will be listed online here. 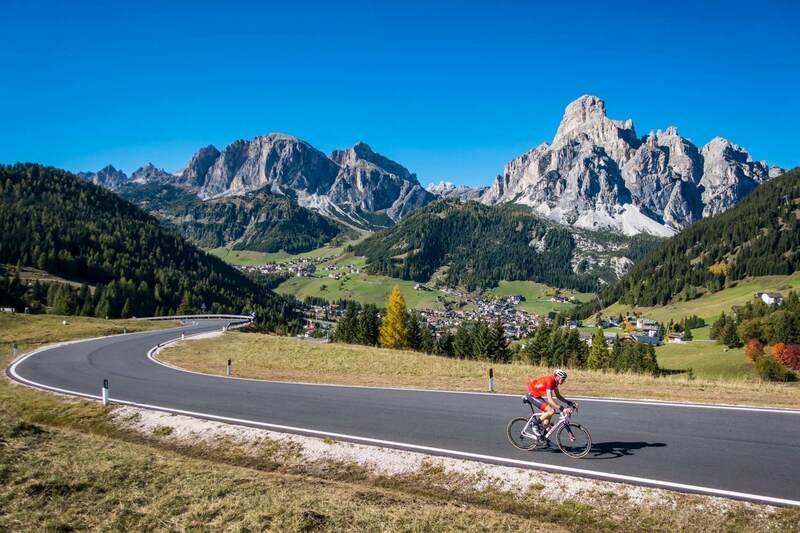 If you book any Holimites road cycling travel package from our catalogue, you'll be eligible to win 2 reserved starting positions in the first corral at the Maratona dles Dolomites - Enel*. *Eligibility to win a free registration with a reserved starting position in the first corral is possible only with purchase of a Holimites hotel + registration package. 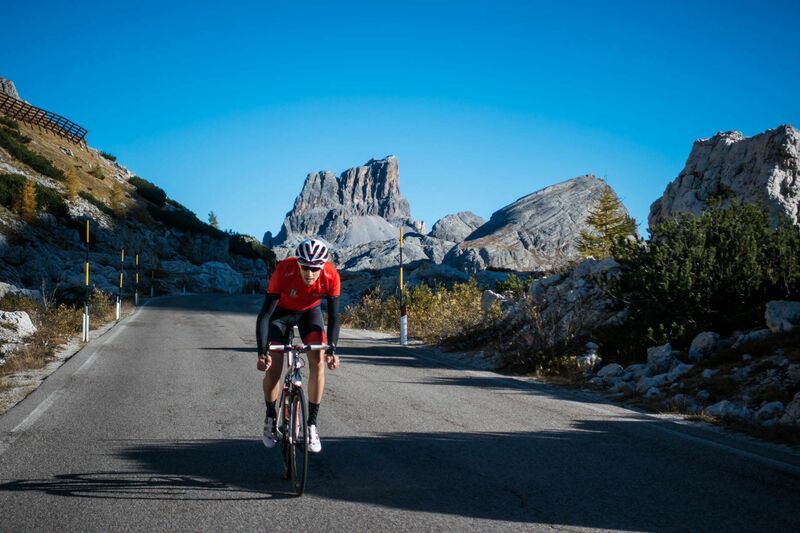 free Colnago road bicycle rental for the duration of your stay with accommodation in an Holimites Partner Hotel. roundtrip transfer from the airport, train station, etc. How does the Colnago free bike rental work? 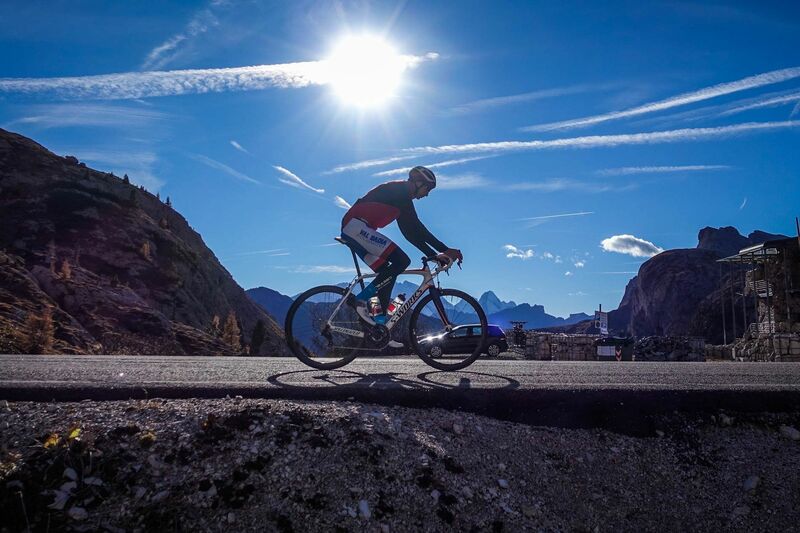 The “Rent-Ride-Relax” cycling package includes free rental of a Colnago racing bike. In order to receive the proper bike size, simply fill out the rental form you will receive at the moment of your booking. Notice: we have a limited number of Colnago rental bikes. If we no longer have the size you need, we’ll help you to find another bicycle to rent at a special price. When do the guided bike tours take place and how difficult are they? Guided tours take place every Monday, Tuesday and Thursday during the months of June and July. 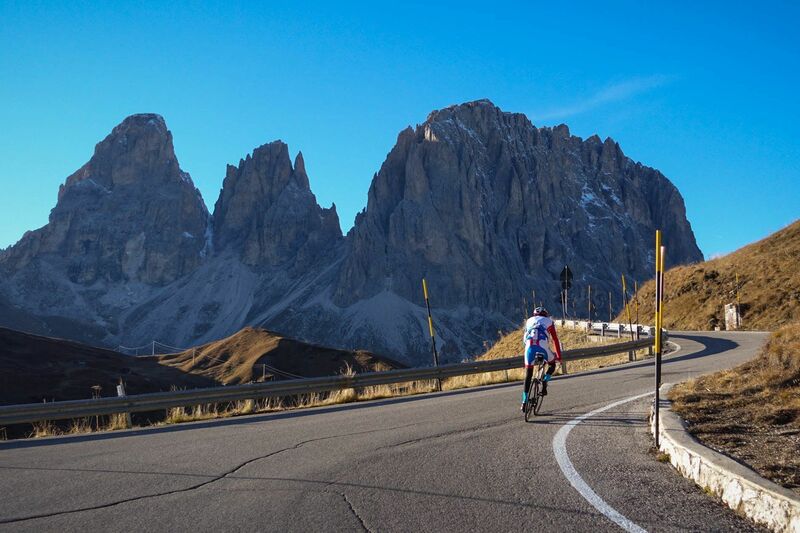 A local, expert guide will take you to discover the Dolomites’ most beautiful routes. Each day you can choose between two levels of difficulty – TOUR and HOBBY. 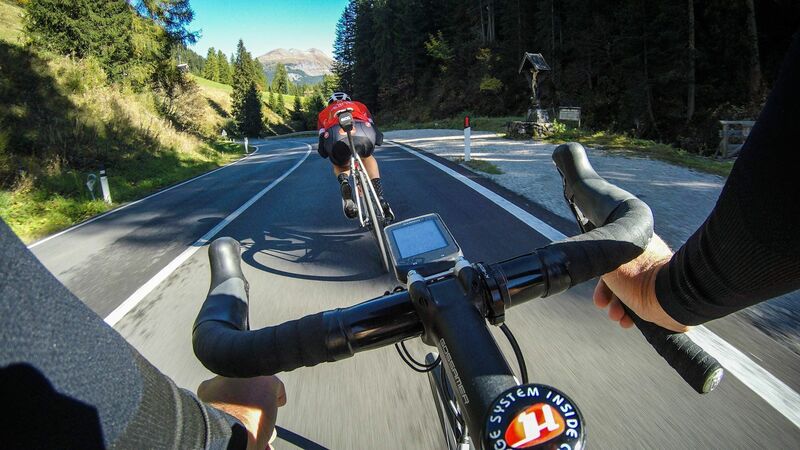 TOUR level is designed for bikers with top athletic preparedness while HOBBY level is for those who prefer a leisurely pace to enjoy the unique Dolomite scenery. Guided bike tours must be reserved ahead of time and are available for an extra free. Do I need to reserve additional services? Of course not. You can decide to reserve extra services (such as guided tours or airport transfer) when you book your package. The cost for each service is listed during the online reservation process. 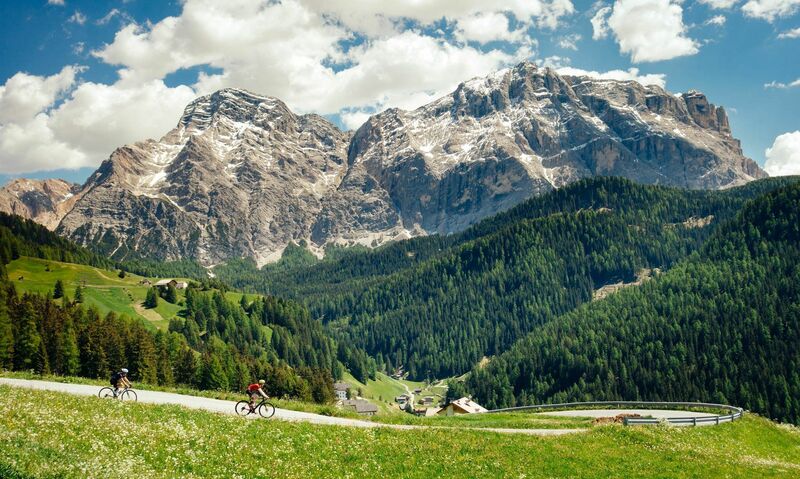 Outstanding experience, from bike rental to lodging to Alta Badia ski passes, and everything in between. All went perfectly and made our enjoyment of the gorgeous scenery and culture of the Dolomites that much easier. An outstanding bicycling company that takes care of everything a cyclist wants and needs during an international trip. On-site support met and exceeded our expectations. 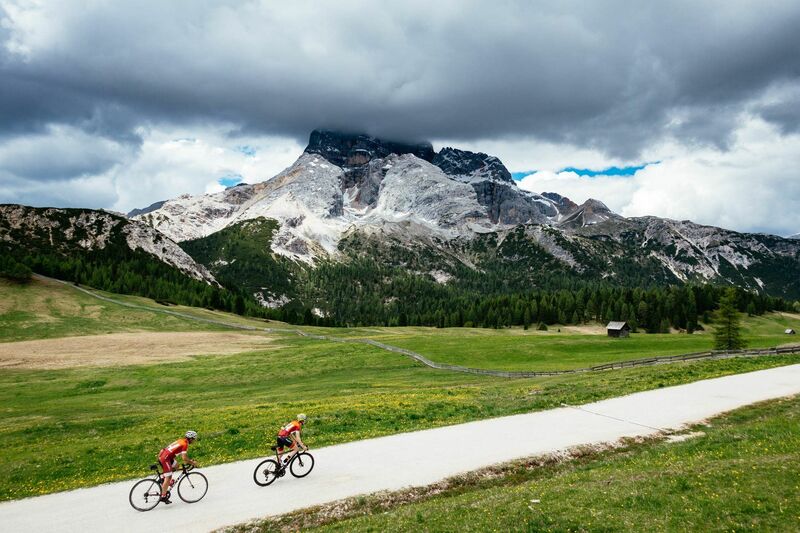 They take the worry out of bicycling in a distant land so you can enjoy riding and experiencing amazing scenery, charming towns, high mountain passes, and the unique Dolomite spires. Being enthusiastic general bike riders and hikers we could not decide which type of activity to choose on our holiday in the Dolomites. And would we really bring our bikes across from Australia given we were travelling further around in Europe afterwards? It turned out that Holimites' Ride&Relax was the optimal solution. They were extremely helpful the whole way through with respect to choosing the right package to quality of the equipment to friendly face-to-face interaction. We are determined to use them again in the future. Thank you to all the Holimites staff and the family and staff at Ustaria Posta for looking so well after us and creating the framework for a perfect holiday which we didn't want to end. Looking forward to next time! ... everything was smooth as silk. We checked in, we walked round the corner to collect our bikes (which were set up perfectly) then back to the bar for an ice cold beer. The rooms are spacious, the breakfast is plentiful, the area is absolutely stunning .. breathtakingly so. We were Bed & Breakfast .. but ate quite a few evening meals in the hotel restaurant because the food is very, very good there. The goodie bag you get with cycling package was great .. I wasn't expecting anything other than a bike, but the info, suggested routes and maps were all enormously helpful. We used then every day to plan rides, compare hills etc. We booked 4 nights with Holimites in their Rent Ride Relax package and stayed at the Hotel Ustaria Posta. Our booking meant we had 3 days FREE hire of the excellent Colnago CLX 3.0 road bike, we also paid for one day's supported ride. Everything was superb from the organisation, the goody bag on arrival, food and drink, hospitality from our hosts and support from the Holimites staff. Marina who drove the minibus on our supported ride was very helpful and charming. Overall we couldn't have asked for more. We booked a rent-ride-relax trip with Holomites for 10 days. It was brilliant, we were provided with excellent road bikes, Colnago's with Ultegra Groupsets, the bikes were in very good condition. When we arrived at the hotel we were given 10 detailed cycling maps, the routes are also provided in .gpx so you can upload it to your Garmin for turn by turn directions. The routes were brilliant, they ranged from hard to absolutely brutal! Holimites also arranged a brilliant guide, Andrea, to take us to Stelvio for a great day of riding, it is a long day but highly recommended. We had a few interactions with Holimites during our trip and they were always very quick to answer our questions. We stayed at the Gran Ander Hotel in Badia. Wow, what a treat! The owner, Andrea, is the Chef and the food is delicious! Breakfast was awesome but dinner was memorable! 5 course dinners with a great selection of wine to choose from made every night a feast. The hotel is owned and run by a lovely and passionate family, housekeeping is brilliant and all our requests were happily dealt with. The view from the deck is breathtaking and we tended to start and end every day on the deck enjoying the view. A special shout out to Anka, we were incredibly well looked after by her, nothing we needed was too much trouble for her, she is exceptional at her job! cant rate the hotel highly enough. everything was excellent. this was my first time in the dolomites and was on a cycling break with 2 friends. everything was provided, bikes, food, routes , laundry, bike storage. nothing was too much trouble for the very friendly staff. all you have to do is cycle. perfect.